My Uncle, John Bede Lennon (1920-1981), joined the PMG as 14 year old in the Depression. He had along history with OTC and associated organisations in Cocos Keeling & New Guinea including Port Moresby, Wewak, Rabaul,Fanning Is. He was occasionally at Paddington. I am interesting in knowing what sort of person he was at work and the things that he did when at work. day after I’d left OTC, but unfortunately I missed him as I was at work. I believe he was also at VIE but I don’t know when. Johnny (as he was known)Lennon was a popular ‘larger than life ‘ character.Whenever he returned to Sydney between outstation postings,he always made enthusiastic contact with staff he knew ,and those he didn’t know so well.He had a loud voice which could be heard wherever he was, sharing experiences of life at remote localities.He had a ‘heart of gold’ and, I remember being told,would do anything to help.As far as I know,he was single,but had many friends. Sadly most of those who served with him at outstations are no longer here. Pity my dad not still alive! 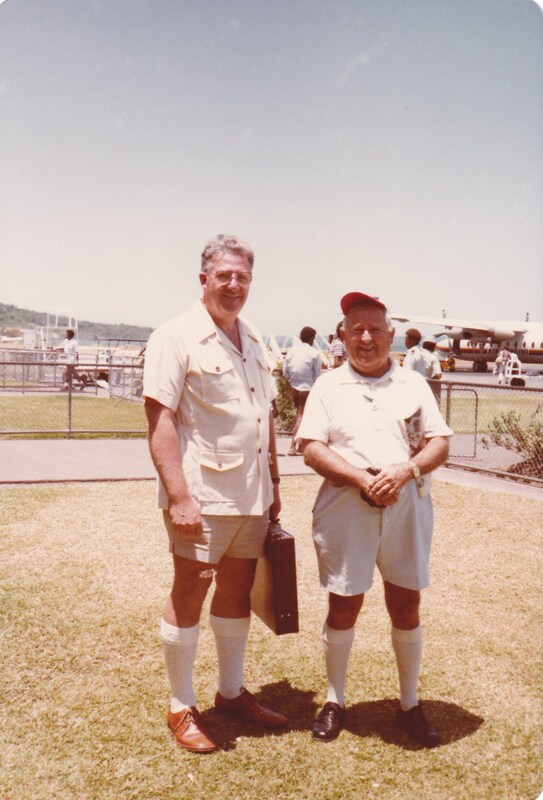 I was way too young to remember anything, but we were at Moresby, Wewak & Rabaul 57 through 60, so given the similarities if timing, my Dad – John (Jack) Fisher (AFP), may have known him…. and afterwards a couple of beers in the pub before we all went home. I remember that John Lennon was a bunch of energy and always cheerful. He told us many a story about his travels all around the world. I remember John Lennon very well, he was a very likeable character who had a fantastic memory but could never stop talking. I was stationed on Fanning island with John who was a bachelor and lived in the Single Mens Quarters next door to the Office. This was because of the poor postal service with a Supply ship only calling very 5 months and and no Air facilities. John being very verbose always exceeded the word limit by at least 200 words. Hope this helps, if his nephew wants further info, he can give me a call on 08 9409 2572 or send me an e mail to ddkinnersley@gmail.com. very entertaining chap to work with and was quite a raconteur. passing. In Portmoresby he was a very keen tennis player. someone else probably has a better recall of that event than me. thought the real Beatle John Lennon was coming. story from the middle of the last sentence. It was quite unusual. I think you will get plenty of stories about our old mate. If it is the same John Lennon – I worked with him briefly when he returned from Rabaul. This was in the investigation/statistics for telegrams. In MLC centre as I recall. John was a very lively character and always very busy and loud! He had been in New Guinea for many years and would have found the office environment a bit strange. One story that was related about him concerns a baby that died in Rabaul (possibly an employee’s child). John was said to have dug the grave out of solid coral/stone – apparently it was a herculean effort. This seemed to be typical of the man who was very well liked by all he worked with. I knew Johnny Lennon when he worked in the Traffic Section of Head Office. He worked there for a while before he retired. He had cancer & died shortly afterwards. He was a bachelor & a very jovial & outgoing character. He was very likeable little guy about 5 feet tall . Des Woods knew him very well as they were on Fanning Island together. Unfortunately Des passed away in December 2012. We have some luck on this one. One of my bosses I worked with for many years Jack McGrory (Traffic Accounts Melbourne ) often spoke of John Lennon I am not sure if he ever worked in Melbourne or not but I feel there relationship was probably through the Wagga Wagga weekends . Any way I remembered to look at our OTVA application for Membership files of which we have some photo copies of Sydney members of which we have for John Lennon 2 pages submitted as per attachments. Hope this will be of some great help. NOTE: This Employment History of John Bede Lennon has been emailed to Greg O’Sullivan by Peter Bull. Well if it is the same John Lennon that I knew as an telegraph operator in SOR Sprint street late 1959-60 I can still remember him as a ball of energy, always had a tennis shade on his head and if there was ever a circle of operators in a location it would always be John in the centre telling a story and boy could he talk, John was one of the best telegraph keyboard operators ii saw in SOR his speed of typing and accuracy was brilliant. Always remember John for who he was. I worked in Port Moresby during 1971-72 when John Lennon was supervisor of the telex operators. John worked up on the top floor of this new OTC building in Port Moresby. OTC techs worked on the floor underneath which had the Hasler Tor & Siemens FRXD mechanical tape punchers endlessly chattering away with telex traffic. Also in this room was the GEC lincompex terminals & an old STC “Top 20″ voice terminal all for phone traffic. The Australian end of all this equipment was in Paddington Exchange. On the bottom floor was the managers office & Stan Silver was in the chair while I worked there. Tony Hansen & later Derek Hallam were our TO2 technical supervisors. The public telegram receiving counter was also located on the ground floor. Today all this telex is of course made obsolete by email. Apart from the odd telex switchboard fault, the most common reason for us to get called up by John Lennon was to fix a jammed telegram canister. 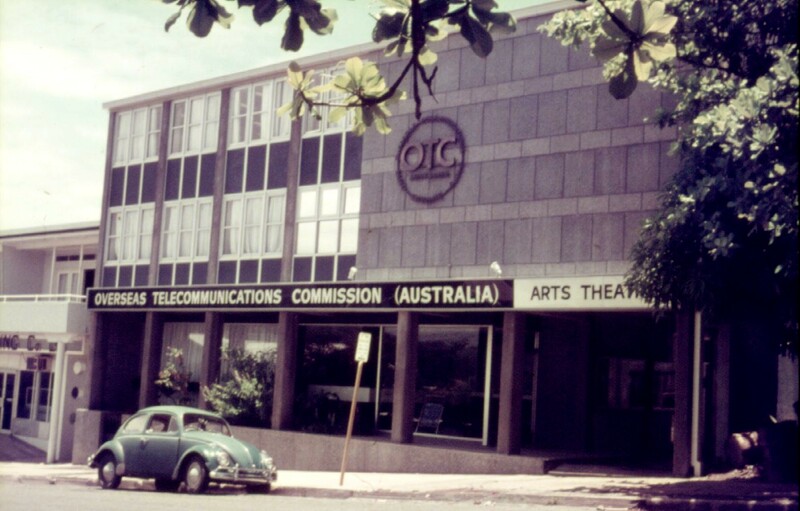 OTC had an air pressurised telex tube system that ran from this OTC office in Douglas Street down about 300 meters to the Post & Telegraphs Office on Stanley Esplanade. Jams were frequent & fortunately we managed to clear all blockages otherwise the street would have to be dug up. I can never remember John driving a car in Port Moresby. 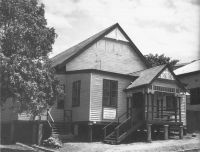 He lived in an older style OTC house high up a steep stairway on the corner of Musgrave Street & Ela Beach Road in town. His house was directly opposite St Mary’s Catholic Cathedral. It was a 5 minute walk to work & even closer across the road to the Ela Beach RSL club where he loved to relax. We stayed in John’s house temporarily while he was on 3 months leave. John went to Russia & when he came back we invited him around for tea & he put on a slide show on Russia for us. John was dedicated to his work in OTC. His work motto seemed to always be ” OTC’s telex traffic must go through”. He was an easy man to work with & others enjoyed working with him. Let me further explain the OTC building photo. When OTC were looking to build their new town office there was no suitable land available in Port Moresby CBD. So they did a deal with the well established Arts Theater & built their new building in front of their old wooden one. That is why the access driveway under our building to theirs was built on the right side. The silver on the windows in the middle of the building was reflective foil on the techs workshop to help the air conditioning cool our area. Johns old OTC house has also been demolished on the corner of Musgrave Street & Ela Beach Road. In fact all the buildings except one large one have been demolished in this block. Looks like they plan rebuilding on this valuable elevated land just a walk from Port Moresby CBD. I’m attaching a photo of John Lennon (on the right with the cap) with my husband Gray at the OTC Wagga Races during one of the many Wagga Weekends we attended. Is this the same John Lennon? I only met him a few times but Gray knew him very well. I remember he had a very infectious laugh and a happy personality, a really nice bloke. Although we spent many years in Papua New Guinea I don’t remember John being there at the same time as we were. Over the last few years I remember Mick Wood saying that John had taught his daughter Helen to swim as a little girl. She suffered badly with asthma and John said learning to swim was the best thing for that. He thought John was a good bloke. That’s about the extent of my knowledge of yet another OTC “old timers”, and hope this will help his nephew. I worked with John in Port Moresby at PNG P&T, on secondment from OTC, for 2 1/2 years from 1974. He was my next door neighbour while living in OTC houses at Ela Beach. I am not sure what John went to PNG to do but he worked in the Finance Department of PNG P& T for a while. He would often call into my place for a chat and a beer after work and would tell us about his many overseas visits – he liked to travel. He was a very outgoing person who made friends easily and would keep in touch with these friends that he had made overseas and often stay with them if he returned to their country. He loved swimming and every afternoon would walk across the road to Ela Beach and do laps of the beach. His stroking was so slow and would propel him along at a snails pace – it seemed effortless. He would swim for about an hour and then cross the road to home. He was a short, portly man, and in his budgie smugglers really stood out as he walked home. People would toot their horns and he would give them a wave in return – didn’t care. I suppose you would have considered him eccentric. He was very well liked by everyone. I left Port Moresby in late 1977 and I am not sure whether he left just before or just after me. I met up with him a few times when I returned to OTC in Sydney but then lost touch. I think he had family in the Paddington area. It’s not much information but a small idea of what John was like. Yes I can remember him in the SOR circa 1959 at times. He was living in Bondi and used to cycle to work every day. I also knew him from the Bondi Icebergs of which we were both members. Google “Black Saturday in Bondi” – this was a Daily Telegraph article from down in Bondi in 1938 and I remember him telling me he was involved in the rescue process that took place with a lot of the guys from the Bondi Surf Club. I believe he told me that after the rescues they had a wip round and gave a lot of the guys who took part Five quid each..!! I remember John Lennon, he went to the Wagga weekend every year he could make it , he was a small man with a powerful voice and when he spoke everyone listened. He did his best work in New Guinea and was a representative of that country at the Olympic Games .He was a very strong surfer when it was getting going and was known as Ebb Tide, He was in hospital in the end and the General Manager of OTC at the time went along and presented John with his gold watch for service as it looked as if he would never recover which unfortunately happened. Tell his nephew John was a man every one loved and respected.